I hate to start things off on a negative note, but the way I see it, New Year’s has got to be one of the lamest events on the entire calendar. We Americans do a real bang-up job on all our other holidays, but for some reason, we’ve completely dropped the ball on New Year’s. Literally. As a result, the whole thing is stale, outdated, and desperately in need of a facelift. Of course I’m no expert at marketing, but I’m willing to take a crack at giving our current New Years traditions a complete makeover. Let’s start at the beginning. We celebrate New Year’s on January 1st, and have been doing so ever since the introduction of the Gregorian calendar in 1582. (Don’t ask me how I know these things. Just be impressed that I do.) Well right off the bat I see a huge problem. January 1st falls just one week after Christmas, and nobody is in the mood for another holiday. We’re still in recovery, so to speak. A dead pine tree is lying out on the curb waiting to be picked up by the city, tinsel still fluttering from its brittle branches. A poinsettia sits neglected on the floor in front of the window, dropping petals like distress signals. There’s a turkey carcass in the refrigerator, too, but no one will eat it because it’s starting to taste metallic. Now I ask you, is this any time to bring up a party? Certainly not. We should move New Year’s to February 16th, when there’s totally nothing going on. Oh wait, that’s the date of the Westminster Dog Show. Better make it March 4th. Lots of holidays have really neat songs. 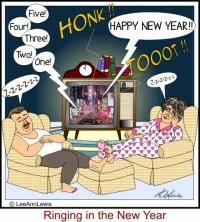 What does New Year’s have? "Auld Lang Syne”, as if anyone knows what THAT means. Yawn. What we need is a zippy new tune – maybe something by Martina McBride. The symbols of the holiday need some serious help too. Think about it. A long-bearded, shriveled up old man with death written all over his face, and a drooling baby in a sagging diaper. How can they possibly compete with the Easter Bunny and Santa Claus? We need something new. 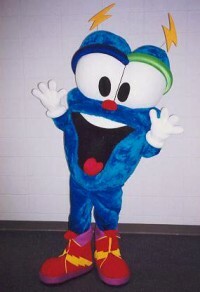 I understand "Izzy”, the mascot from the 1996 Summer Olympics in Atlanta, is having trouble getting gigs. We could probably get him pretty cheap. Let’s see, what else? Oh yes. New Year’s Resolutions. Those have got to go. I mean, is there anything worse than seeing a list of our worst attributes on a sheet of paper? Not only that, but our attempts to correct them all at one time only doom us to immediate failure, which puts us in a bad mood the rest of the year. I recommend doing away with the resolutions altogether and replacing them with a list of things we’d like to change about our relatives. Trust me this can be a most gratifying exercise. And then there’s the ball in Times Square. What is that all about? A huge lighted sphere slowly descends from a building, while on the street below thousands of revelers cheer wildly, while throwing confetti and throwing up. And that’s not the worst part. All across the country, millions of Americans are fighting to stay awake in front our television sets as Al Roker hosts this bizarre event, which for most of us took place at least an hour earlier, what with the differences in time zones and all. Is this the best we can do? I don’t think so. Perhaps we should celebrate New Year’s Day like they did in 1664, by holding a turkey shoot in New York City. If nothing else that should clear out all those rowdy revelers! Well, I guess that just about wraps up my recommendations for revamping the New Year’s holiday. If you’re interested in implementing any of them, I’d be happy to discuss further details. Just don’t call me on January 1st. I’ll be vegged out on my sofa, watching twelve straight hours of parades and football games. (After all, there are some traditions you just don’t mess with.) Happy New Year! Search for Holidays articles similar to "My Pitch for A New, New Year. Search all articles similar to "My Pitch for A New, New Year".